Check out Frank’s interview with ICNY host Hannah Meholick in which he talks about his own history with faith and what are the key factors in inciting non-violence. 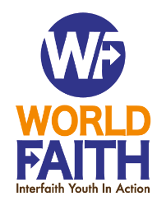 Join the World Faith Team- make a commitment! The First Jew I Met Excerpt from a story by Chad McKnight, Outdoor Education Coordinator Read the complete story in the upcoming Interfaith Appalachia Journal, a collection of testimonies, stories, and art from participants and IA community members. Clinton Global Initiative recently interviewed Frank Fredericks about what it’s like to launch a startup in: The Stories Behind The Startups: Frank Fredericks, CGI University Class of 2008. Congratulations Shahid, Acumen Fund’s Pakistan Fellow! Food, Fun, and Faitheism: World Faith’s Annual Winter Gala! Join World Faith for our 2012 Annual Winter Gala! Celebrate an evening of food, fun and faitheism. This year, World Faith will be honoring Chris Stedman, author of the revolutionary book, Faitheist: How an Atheist Found Common Ground with the Religious. Don’t miss an evening of great drinks, food, and conversation!